Named for John Hancock John Hancock [1737 - 1793] was the first governor of Commonwealth of Massachussetts. He was a member of the Continental Congress from 1775-80 and 1785-86, serving as President of the Congress from 1775-77. Hancock is most famous as the first signer of the Declaration of Independence. Hancock made his signature large, "So the King of England could read it without his spectacles" or so the legends say.... Established Seven Years after Illinois became a State Formed on 13 Jan 1825 from unorganized territory attached to Pike County, Illinois. The first county courthouse was at Montebello, on the banks of the Mississippi River between Warsaw and Nauvoo. The town site is no longer occupied, but is marked by a plaque placed by the Hancock County Historical Society at the Hoot Owl Rest Area along the River. In 1833, the General Assembly of the state of Illinois, commisioned the founding of the first permanent county seat at Carthage, in the center of the county. 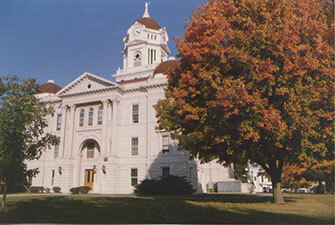 The first log courthouse was built in 1833 on the south side of the square. It was used from 1839-45 for other purposes.